While spring is the perfect time of year to bust out your favorite floral, ruffle, and lacy pieces, it's fun to mix it up and add a little leather in between all the romanticism. Giving a polished girly blouse majorly edgy vibes, I'll show you how to put a badass spin on springtime classics. Thanks to Hamilton, high-neck ruffle blouses owned the runways this past spring season. But you don't need to feel "stuffy" to rock this trend. Rather than pairing my top with a pencil skirt, I gave it a modern makeover and styled it with so-now accessories and rock-n-roll extras. It all begins with leather. 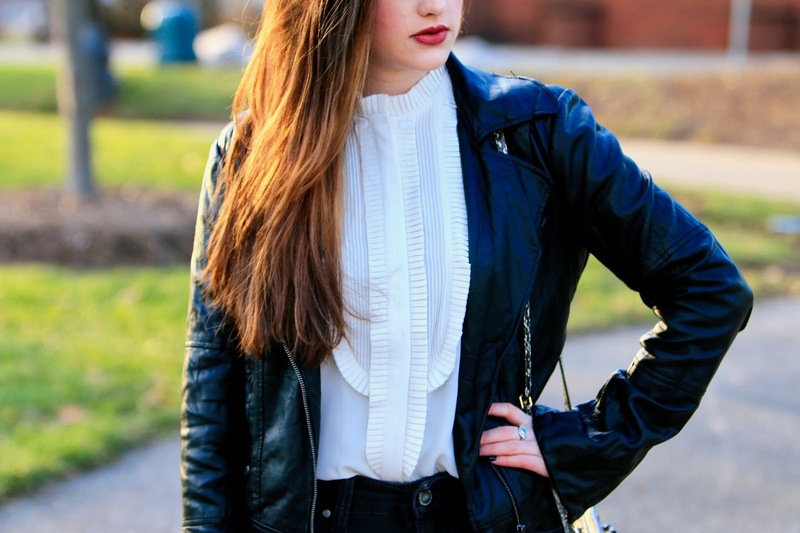 A black moto jacket is a classic closet staple that I can't speak highly enough of. It especially comes in handy in times like these; when you're craving some edge with a side of rocker-chic polish. A layer like this will instantly transform your "grandma" blouse into something suitable for 2017. 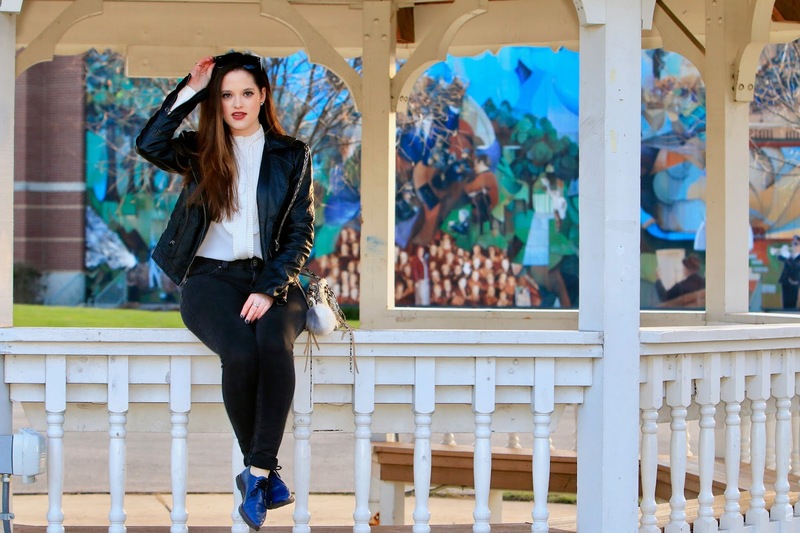 In short, a leather jacket can be a real outfit saver. When simple blue jeans won't cut it, I turn to black denim. There's just something so fresh about a midnight pair of jeans -- they scream rockstar to me. And while I love holey pants, this pair is office-approved and STILL stylish. Paired with a matching black jacket, this may just be your new uniform. Black and white is great and all, but I couldn't resist adding a dash of fun into the mix here. Cobalt blue looks so sharp paired with black, and with a pointed-toe, these loafers are the definition of #ShoeGoals. Without them, my outfit would not be nearly as interesting. Another focal point of my look, a printed bag provides edge and excitement to any ensemble. Leopard is chic and "uptown" while snakeskin is urban and "downtown." Does it get any more classic-cool than Ray-Bans Wayfarers? The answer is no, it does not. 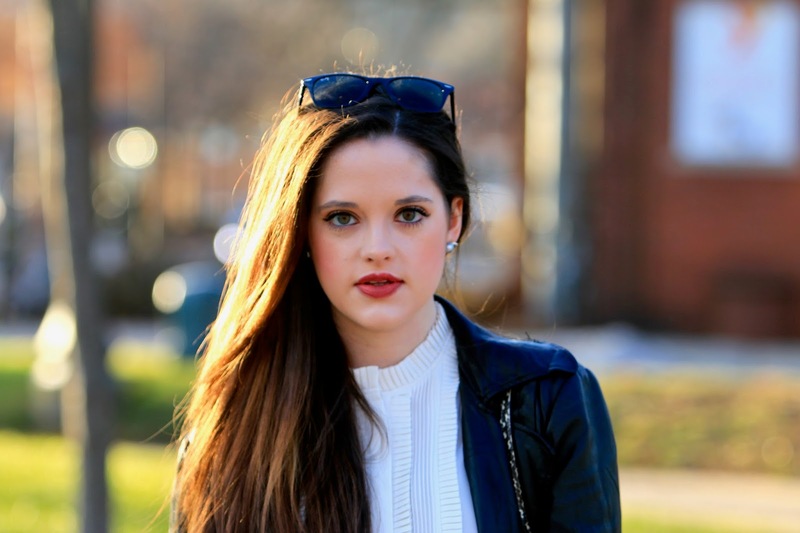 These iconic sunglasses are effortless, versatile, and super hip. White pearl earrings are a lot of things, but "edgy" is not one of them. 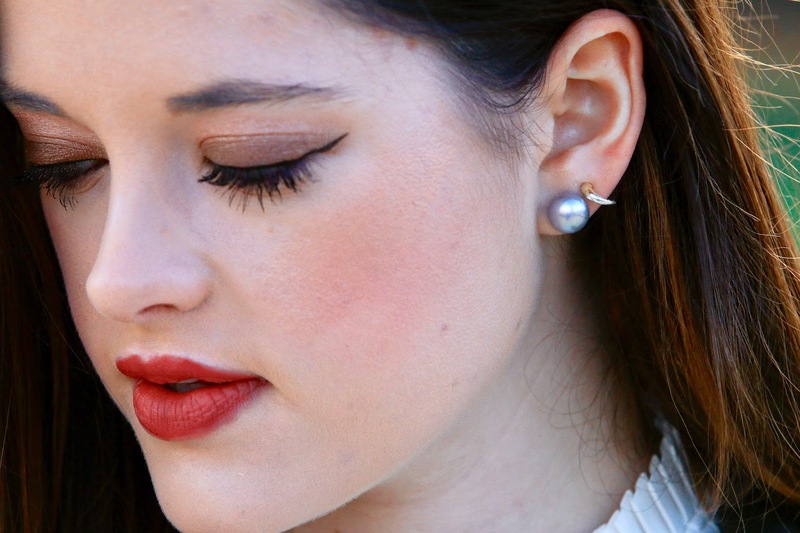 To give my outfit that extra oomph, I put on gray pearl studs. They compliment my feminine blouse while paying tribute to my moody extras. Neutral makeup with a subtle flushed glow was what I tried to achieve with this beauty look. I love how my lips are unmistakably red, but they're not over-the-top cherry red. It's a happy medium! I put this look together to prove that hard and soft styles CAN live together in harmony. It's all about seamlessly blending romantic pieces with tough pieces to create a modern feminine aesthetic. And honestly, I'm kind of hooked on the result! A huge YES to this outfit! 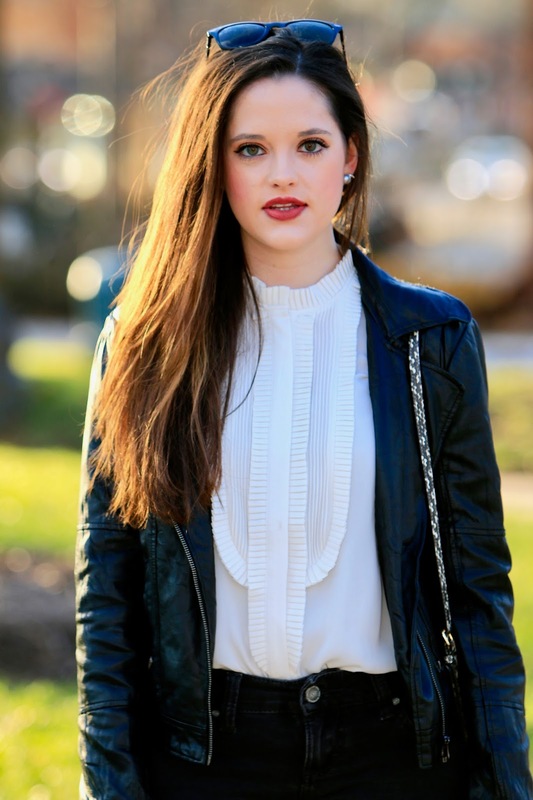 I love pairing feminine pieces like your top with an edgier moto jacket!